With rising fuel prices, we'd hate for you to waste your precious RP-1 guessing how to burn your engines to get where you want to go. 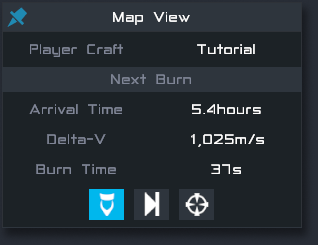 In SimpleRockets 2, you can plan your burns by clicking on your current orbit and adding a Planned Burn. From there you can easily drag gizmos around to manipulate that burn and Map View will show the new, predicted orbit. 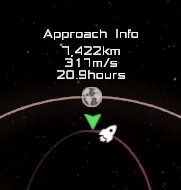 It will also tell you exactly how long you need to burn (and the direction) to achieve that orbit. Here's a GIF where I planned a collision course with the moon. Notice how it updates the orbit in realtime and immediately lets me know that it found an encounter in the future. We considered calling them Burn Soothsayers, but then we realized that was a dumb name. Once you plan a burn you can either try and execute that burn yourself or you can just click the Auto Burn button and SR2 will try its best to accomplish that burn on its own. If you're impatient, you can click the Warp to Next Burn button and it will automatically time-warp you right up to the burn. Results can vary and it depends a lot on the craft, but Auto Burn easily outperforms me. In my defense, I get nervous and my palms get sweaty. I didn't say it was a great defense. Also, if you have set a target in Map View, it will display Closest Approach information to help hone in on getting an encounter. It will give you the distance to your target at that point, the relative speed, and time at which that approach will happen. If one Planned Burn doesn't take you where you want to go, don't worry. You can plan multiple burns in sequence with each burn working off the orbit from its predecessor burn. This has been an extremely tricky feature to implement and thanks goes to Philip for making all of this happen. Hopefully, this will help keep you from getting burned out as you navigate your way around the solar system. So, basically just maneuver nodes from KSP? Love it! @Iron17 Not only him, but I bet the ENTIRE jundroo team is busy. Maybe Andrew's a little busy. Let's just wait. @Nooneoone isn't it next Monday? Can we have a weekly one picture teaser from the game, that is separate from the original teaser? @AndrewGarrison I'm still fine with it at last. @AndrewGarrison Now I have 105 points in SP and I still have 0 points... How much will it take to have the 100 points? @AndrewGarrison Please release this on October 1st because that's my birthday. You used sp2 instead of sr2. Only if there was sp2.